Gov. Rick Scott will ask the Legislature to set aside $30 million in next year’s state budget to give the state’s law enforcement officers another pay raise. Scott will announce his $30 million proposal Wednesday at the Florida Highway Patrol post in Jacksonville. In a statement, he said the money could be used to recruit new officers, but each agency would determine how to distribute the money. Scott’s request is more than double the $12.7 million the Legislature agreed to set aside for state law enforcement officers in this year’s $83 billion budget. The money gave 5 percent pay increases for the nearly 4,000 sworn state law enforcement officers in the state. The pay increase would help state agencies struggling to keep trained officers on the job. For years, FHP has faced high turnover due to newly trained troopers finding more lucrative jobs at county or municipal police agencies. House Speaker Richard Corcoran said although Scott’s request would face the same legislative process as other requests, this year’s 5 percent raise was widely supported by his chamber. The raises would also mean a bigger base budget, but Corcoran, R-Land O’ Lakes, said repeatedly training new officers was also a hefty annual expense. If approved, sworn law enforcement officers at all state agencies could be eligible, including the Florida Department of Law Enforcement and the state Department of Agriculture. The top official from the labor union representing state law enforcement said Scott’s plan is unique but welcomed. Matt Puckett, director of the Florida Police Benevolent Association, said the “out of the box” plan would be an easy lift. Puckett said the FDLE has come up with its own pay increase plans in the past, and those plans may be replicated for other agencies if lawmakers approve Scott’s proposal. Scott’s announcement comes less than a month after this year’s state budget took effect on July 1. Lawmakers are already scheduled to begin gathering in the Capitol for committee meetings in September. The Legislature will address Scott’s request during the 2018 legislative session, which begins in January. The Broward County Police Benevolent Association, Inc. (BCPBA) presented awards to the winners of its annual college scholarship essay contest at the quarterly board of directors meeting held on June 29, 2017. This year’s first place winner is Emily Shimpeno of Pembroke Pines. Emily received a $1,200 scholarship, which will be applied toward her education at Florida Gulf Coast University. 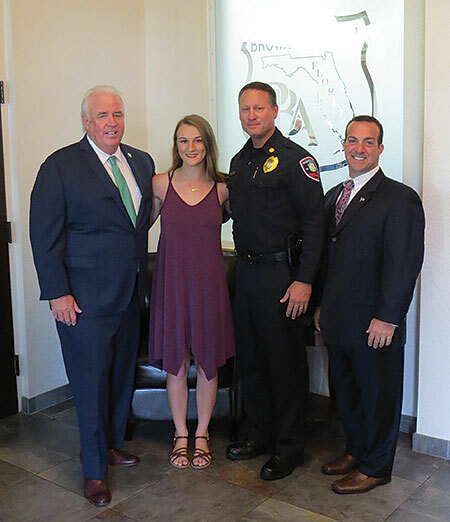 The first place scholarship was sponsored by Matthew Oppedisano of the Wellington, Florida-based Law Enforcement Retirement Advisory Service. The second place winner was Tyler Ray of Pompano Beach. Tyler received a $600 scholarship, which will be applied toward his education at Mary Washington University. The third place recipient was Caroline Volpe of Boca Raton. Caroline will be continuing her education at Tallahassee Community College and then Florida State University. Ivanna Cerna of Pembroke Pines earned the fourth place award, and will be attending Broward College. The fifth place winner was Nicole Pardon of Coconut Creek. Nicole will be attending Florida State University. The Broward County PBA Annual Scholarship Award was founded in 2003 as part of The HOPE Fund’s mission to assist the children of law enforcement members in their effort to attend college. To be eligible for the scholarship, participants must be the son or daughter of a Broward County PBA member in good standing and plan to be a part-time or full-time student at an accredited two- or four-year university. The Broward County Police Benevolent Association today formally requested that Broward Health begin installing bi-directional amplifiers in all of its hospitals to improve radio communications for law enforcement officers. These amplifiers will strengthen the officer’s radio signal and allow communication to penetrate the building’s construction. The installation of bi-directional amplifiers is not just a safety issue for law enforcement officers, but for firefighters, EMS and medical personnel, patients and visitors as well. If an incident were to take place in one of these facilities, not just with an in-custody individual, but for those who are Baker- and Marchman-acted as well, any call for assistance will not be heard. This is an extremely important issue to the Broward County PBA because it involves the safety and protection of law enforcement officers, which we represent over 1,700 throughout Broward County and its municipalities. 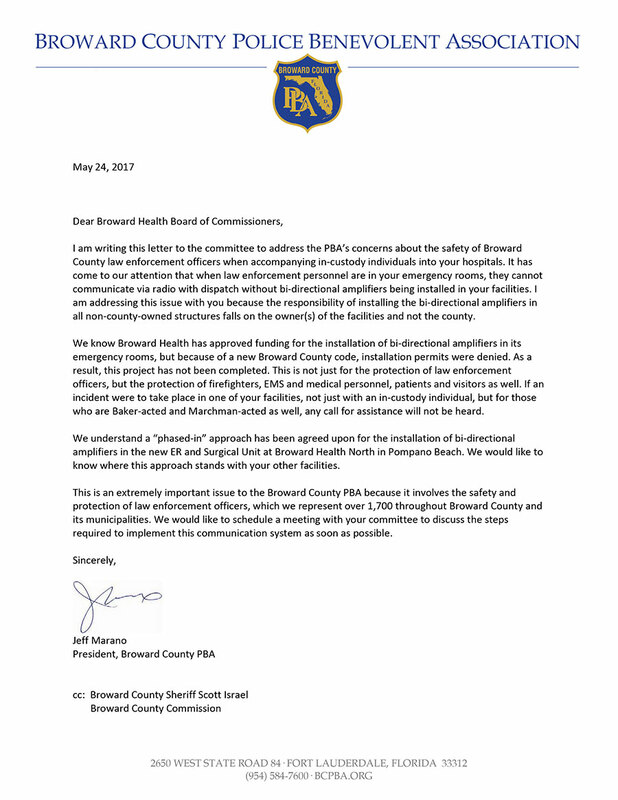 Below is our letter to the Broward Health Board Of Commissioners formally requesting the installation of bi-directional amplifiers. On Tuesday, May 9, 2017, Florida Governor Rick Scott signed the PBA’s body camera review legislation and witness to a murder legislation into law. HB 305 (sponsored by Senator Greg Steube and Representative Shawn Harrison) permits an officer who wears a body camera to review the footage prior to making a statement, or writing a report on an incident. The effective date is July 1, 2017. HB 111 (sponsored by Senator Randolph Bracy and Representative Cynthia Stafford) prevents the identification of a murder witness from being available through a public record request for two years. The effective date is July 1, 2017. We thank the Governor and our sponsors for their support. As always, please stay safe. – Both local police pension bills for West Palm Beach HB 1135 and Tampa HB 535 have passed. The changes to these plans are the result of local collective bargaining changes and compliance with the statute changes of 2015. – The Governor received the body camera footage review legislation HB 305 and has until Thursday, June 11th to act (sign, veto, or do nothing which allows it to become law). The legislation permits an officer who wears a body camera to review the footage prior to making a statement, or writing a report on an incident. The effective date is July 1, 2017. – The witness to a murder legislation HB 111 and training for autism awareness HB 39 have both passed the Legislature. HB 111 has been presented to the Governor and, like HB 305, he has until Thursday to take an action. This legislation prevents the identification of a murder witness from being available through a public record for two years. – Totally and permanently disabled first responders & surviving spouses of totally & permanently disabled first responders shall receive a 100% homestead tax exemption via HB 455. – There will be no increase to the FRS employee contribution. I should probably mention there will not be a decrease either. 1) Survivors of a special risk member killed in the line of duty on, or after July 1, 2002 will be able to receive 100% of the member’s salary at the time of death. This benefit was added during last year’s session, but the retroactivity only went back to September of 2013. 2) Florida Retirement System employees who were enrolled in the FRS investment plan then left FRS employment and took a cash payment from the investment plan will soon be able to re-enroll in the investment plan if they are reemployed by an FRS employer. This new reemployment provision only applies to former members of the investment plan at the time of separation and does not apply to retired members of the pension plan who are reemployed by a FRS employer. The effective date is July 1, 2017. Current employees who were previously investment plan members and have been barred from participation since reemployment are eligible after July 1, 2017 to apply for re-enrollment in the investment plan. The change allows the member to participate in the investment plan as a member of special risk if the member qualifies. – There is one additional change to the Florida Retirement System that does not apply to special risk members. After January 1, 2018, all new non-special risk employees will have nine months to select either the investment plan, or the pension plan. If the employee fails to make an active selection following the nine month selection period that employee will be defaulted into the investment plan. The employee will still have a one time opportunity to select the pension plan at a later date in his, or her career. All newly hired special risk employees will continue to default into pension plan even if they do not make an active selection within the first nine months of employment. The newly hired special risk employee will also still have a one time option to make a switch later in his, or her career. – SB 7022 also creates the ability to actively select, or collectively bargain for more options to the State Group Health Insurance for state employees. The current insurance provisions will remain in place with additional options to come on line in later years. The options will be subject to approval by the Governor, Senate President and Speaker of the House. Effective July 1, 2017, there will be no increase to the employee’s Health Insurance premium. On July 1, 2017, Law Enforcement Officers in the PBA’s Law Enforcement, Florida Highway Patrol, FDLE Special Agents and Lottery Law Enforcement bargaining units will receive a 5% increase to his, or her base rate of pay. These officers will not be eligible for the September 30, 2017 pay raise that other state employees will receive. a) Employees earning less than $40,000 per year of base salary will receive a $1,400 increase to his, or her base salary. b) Employees earning more than $40,000 per year of base salary will receive a $1,000 increase to his, or her base salary. On October 1, 2017, all Correctional Officers employed by the Florida Department of Corrections in the PBA’s Security Services bargaining unit will receive a $2,500 increase to his or her base rate of pay. These officers will not be eligible for the September 30, 2017 pay raise that other state employees will receive. Correctional Officers below the new minimum base salary for the class code will receive the necessary salary adjustment to the new base amount even if the amount exceeds the $2,500. The omnibus bill SB 7022 which dealt with FRS retirement, survivor death benefits, health insurance for state employees and pay raises for state employees is unique. The puzzle that was constructed in that legislation just goes to show how many issues the PBA was negotiating over at the end of this session. This particular bill also illustrates how every issue was leveraged against the other in order to complete a final deal. Of course, we did not receive everything we set out to receive. Yet, we moved the needle in the right direction (in a few cases, the needle moved substantially) and did not lose any ground. We just did not get everything we wanted. Here’s how long some of the issues in SB 7022 have been waiting to be resolved. The negotiations started in July of 2011 over the default change to the pension. The health insurance negotiations have been around since 2012. The death benefits and reemployment provisions have been in the negotiations, off and on, since 2013. And of course, we negotiated over the latest round of pay raises starting in 2016. Multiple years in many cases that all came together in one big bill SB 7022. Considering how this 2017 version of the legislative session will finish, our team did a good job. Nobody, from the Governor on down, got everything they wanted. There will be a four month break before the session starts all over again, PBA will be working on ideas to create a COLA reinstatement for FRS employees, along with redrafting legislation to double salary incentive monies and create a step plan for our state bargaining units. Not mention other issues that will be added to our agenda over the next four months.